Sequel to Human Head Studios and 3D Realms produced first-person shooter Prey, has just had its first screenshot unleashed onto the internet. Prey 2 is going for quite a different vibe; the first game included loads of portals and topsy-turvy puzzle. The sequel will drop all portals and puzzle elements; it will also be open-world and more like EA’s Mirror’s Edge and Mass Effect. The Mirror’s Edge part comes in because your character will be able to pull of some pretty nimble moves. The Mass effect similarity? Well, just take a look at the first screenshot and accompanying concept art to answer that question. The game is definitely channelling Mass Effect in art style and alien design. The dead guy on the floor is wearing something that reminds me a lot of what Mordin wears in Mass Effect 2. 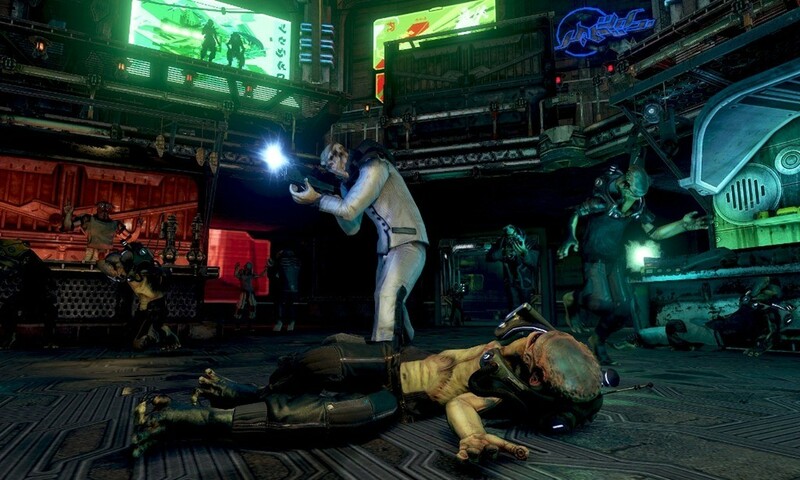 Furthermore, the alien with the gun definitely resembles Mass Effect’s Batarians. As for the concept art, well that just screams cityscape from any science fiction scene, but it looks damn cool anyway. Do you like what you see? I sure as hell do.